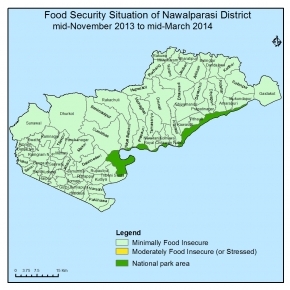 The overall Food Security situation is Nominally Food Insecure. House hold food stock for 9-12 in Cluster A,B and 6-9 month in Cluster C. Paddy in cluster A,B and Maize in /cluster C,B, which are the main summer crop of the district, has Recently been harvested and the production was normal.Good Income From sell of cash crop ( vegs, ,banana,Orange,honey,mushroom,Fish), and livestock production (Milk,Meat,leather). Employment opportunities from -agricultural activities ,factries,construction .And normal season of out migration, trend is normal.,remitance.There was sufficient food stock in the market to fulfill the demand and the market proce also normal(Only 5%increase than last year). There was no natural disaster causing food loss and civil security was normal during this cycle. The food security situation of the Distirct will remain the same as nominally food insecure.HH food stock will be sufficient for more than 4 months from previous harvest (paddy). Good purchasing capacity Form Sale of cash crop and livestock product will be continued. Similarly there will be income from remittance and employment opportunity will also be available in agriculture & factory. Market price may be stable due to sufficient stock and good road network and market stock will remain same. People will rely on traditional mechanism as wage,sell of cash crops, out-migration.